Now, we eat it. Well, I do. That nasty/goopy/slushy mess that we stuck on pigdog-shaped terracotta pots is now edible. I guess it was edible then as well, but who wanted to be healthy in the 70’s? Not me, I wanted a grassy covered pigdog planter. Now I want to eat chia – not grow it. It’s funny how food trends come and go, and some stick around. I hope chia does. It will in our house, it’s just so flingin’-flangin’ good for you! Let’s get a few facts out of the way here – flowering plant in the mint family…..Pre-Columbian Aztec staple…..Mexican state of Chiapas received its name from the Nahuatl “chia water” or “chia river”…..Aztecs used chia for hydration and stamina in battles……5 grams of fiber in one tablespoon……Omega 3’s……keeps you full…..enough? Good. So….how do you eat it? 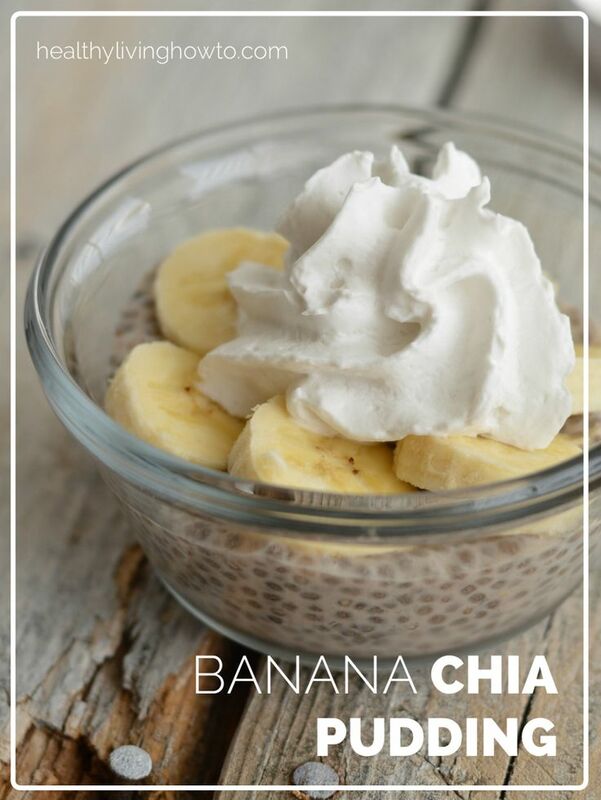 I didn’t have a clue how to eat it when I wanted to try chia, so I went to – say it with me – Pinterest! Well, actually I went to Whole Foods and bought a grape kombucha with chia in it, and enjoyed it so much that I bought the chia seeds. Then I went to Pinterest. Wow! Overwhelming chia choices all over Pinterest – so I managed to find a few recipes, pin them, and try some. 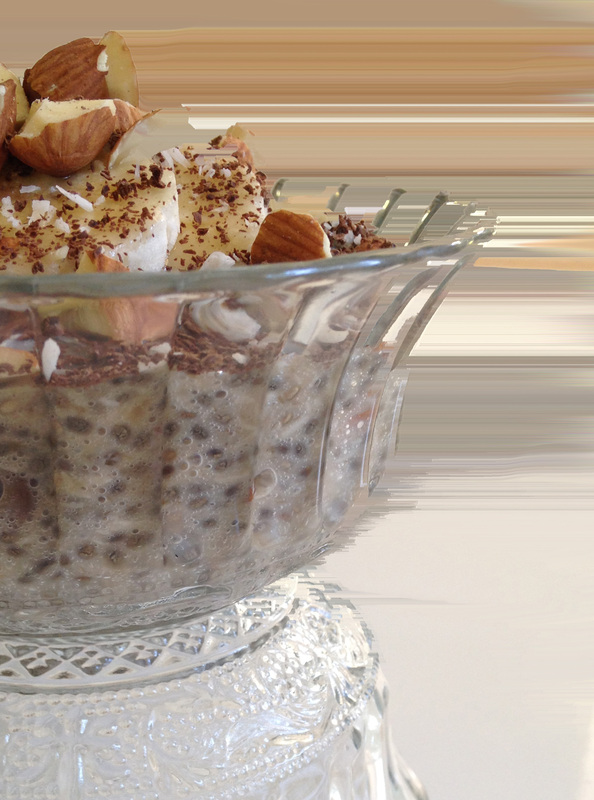 There is no wrong way to consume chia – although I would NOT suggest eating it straight, as some websites suggest. It can make a ginormous uncomfortable lump in your stomach. Seriously. Remember it absorbs up to 12 times it’s weight in liquid. Always mix it in some sort of liquid, yogurt, milk, or you can bake with it. And, you don’t have to buy it from a pyramid marketing business. Their chia is no different than everyone else’s. Chia is available right inside your local grocery store, or through Amazon. Chia takes anywhere from an hour to 12 hours to absorb everything and get nice and chia-ey. We like to leave ours overnight in any medium that is edible. I havn’t found a bad chia recipe yet – just some that I prefer more than others. Now, for the texture/sensory squeamish, here’s a little tidbit for you…..Lando Calrissian, the most difficult man to feed on the entire planet and probly in the universe, tried chia. Not only did he try it, he drinks it every day. He doesn’t particularly enjoy the texture like I do, but he dutifully swallows an 8 ounce glass of grape juice loaded with chia seeds every morning. Without complaint. If HE can do it, I know YOU can. Trust me on this. To be fair, he knows I will, ummm, constantly suggest he try something healthy until he actually does try it. And then, after he tries it I will, ummm, keep serving it to him because he needs to eat healthier. So, the better I can make it taste, the easier healthy life becomes for both of us. But, he will draw the line at juice. He’s not trying it in anything else like almond milk, coconut milk or mixed with oatmeal for a raw breakfast treat. That’s fine. I will! So after scanning Pinterest, I came upon a recipe that I had never seen before! How did that happen? I LIVE on Pinterest! Ok….here’s the front of it……not exactly like the pretty picture from the original recipe above……everyone has Pinterest fails to show. That didn’t help either. But, a Pinterest picture fail is still a tasty win as long as the recipe worked. And it did! 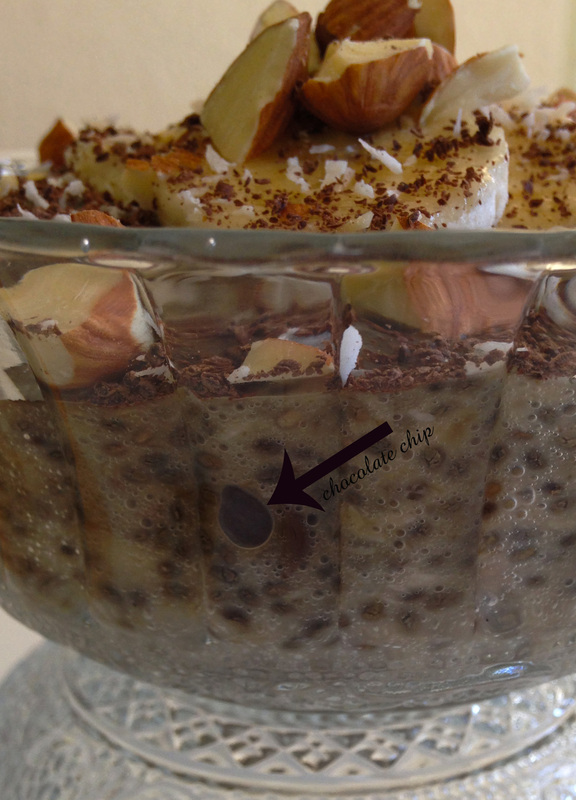 So, for those of you existing chia fans, or if you really like thick pudding, try it! And for those of you that havn’t tried chia yet – maybe don’t try it just yet. Try chia in some juice, or some overnight oats or overnight yogurt like this first. 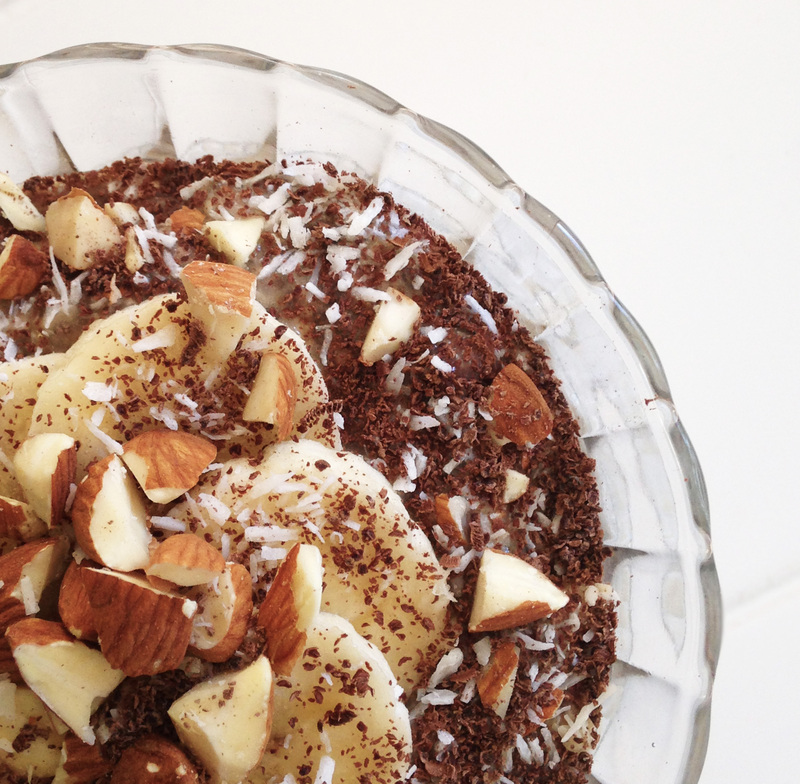 Then, if you want to challenge your chia recipes, jump on in! Tonight I’m using pureed organic strawberries in this recipe as well….stay tuned……. 1. Puree the banana and almond milk together in a bowl. No lumps! 3. Pour into a pretty bowl or glass. Trust me, doctor this one up any way you can! 4. Chill overnight, or at least for 6 hours. 5. Top with chopped nuts, chocolate shavings, coconut, banana slices, Christmas decorations…..anything to make it look nice! 6. Now, enjoy all the healthiness that is coming your way!